Kent Hovind’s Theodore – The Big Reveal! – Kent Hovind v. Robert Baty – The Great Debates! Home→Kent Hovind’s Theodore – The Big Reveal! After about 18 months of living in secrecy and working as Kent Hovind’s technology expert, Theodore has split with Kent Hovind and started his own fund-raising operations. It appears he may have also changed his name from Valenzuela to Valentine. Did Theodore change his name to try and escape his history with Kent Hovind????? Growing up, Theodore and Lenae knew that God was calling them to work for Him in Ministry in some way shape or form. “You mean build a bookstore?” Lenae responded. “Like a place where the layman can get their stuff published. 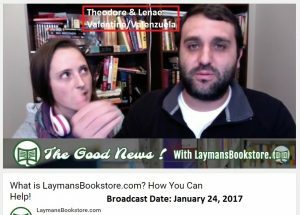 A Layman’s Bookstore…” Lenae responded. After a few weeks, like a lightening flash, Theodore woke up in the middle of the night. “Lenae, wake up!” Theodore whispered while tears rolled down his face. “Yea? is everything okay?” she responded. “Yes, God just put everything together for us. It’s all downloaded into my brain. We are going to put together an online bookstore that will freely give away digital downloads of books, music, videos, movies, documentaries, audio books, you name it… Everything we can produce and what others can produce. We will give out royalties to individuals who put their stuff in the store… like a big marketplace of ideas.” Theodore whispered with excitement. And so goes the story of how LaymansBookstore.com was founded.